Psychological sciences provides a broad overview of many of the sub-fields of psychology. Courses focus on: clinical psychology (mental illness and behavioral problems), cognitive psychology (memory, thinking and reasoning), developmental psychology (human growth and aging), industrial/organizational psychology (how people work together), behavioral neuroscience (biological bases of behavior), social psychology (thoughts and behavior in social situations), learning and motivation, statistics and mathematical models of behavior. Psychological Sciences is developing co-op opportunities for undergraduate students. Students participating in co-ops will spend two semesters working within their field of interest throughout the undergraduate program. Psychological Sciences students have the opportunity to complete an accelerated 5-year Master of Public Health degree. Psychological Sciences offers excellent preparation for students interested in pursuing graduate and professional school, especially law school and occupational therapy. Born and raised in Brooklyn, New York, David Rollock says he was always the kid that other kids told their problems to. That sympathetic ear, an academic curiosity and an infectious personality served him well through high school and Ivy League educations at Princeton and Yale, where he earned his undergraduate degree and PhD, respectively. As part of that research and teaching enterprise at Purdue since 1988, Rollock has earned numerous teaching awards. He was among 10 faculty members across campus awarded 150th Anniversary Professorships. The named professorship recognizes teaching excellence, as well as a history of outstanding mentoring. 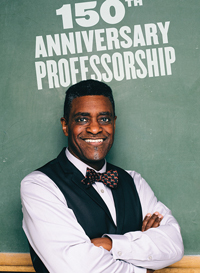 Rollock also has transitioned happily into a mentorship role, having served as chair of the University’s Teaching Academy and becoming a tireless advocate of instructional excellence. Still, it’s hard to beat that exchange with students. “Teaching keeps one on one’s toes,” he says. “It forces us to be clear, as well as thoughtful.